We’d love your help. 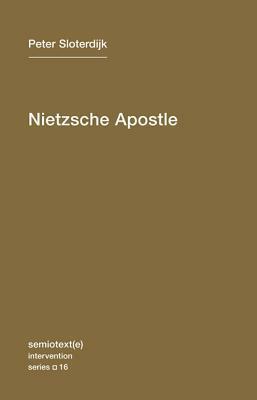 Let us know what’s wrong with this preview of Nietzsche Apostle by Peter Sloterdijk. Peter Sloterdijk's essay on Friedrich Nietzsche and the benefits and dangers of narcissistic jubilation. For Peter Sloterdijk, Friedrich Nietzsche represents nothing short of a "catastrophe in the history of language" -- a new evangelist for a linguistics of narcissistic jubilation. Nietzsche offered a philosophical declaration of independence from humility, a meeting-poin Peter Sloterdijk's essay on Friedrich Nietzsche and the benefits and dangers of narcissistic jubilation. For Peter Sloterdijk, Friedrich Nietzsche represents nothing short of a "catastrophe in the history of language" -- a new evangelist for a linguistics of narcissistic jubilation. Nietzsche offered a philosophical declaration of independence from humility, a meeting-point of sobriety and megalomania that for Sloterdijk has come to define the very project of philosophy. To ask other readers questions about Nietzsche Apostle, please sign up. Interesting essay on Nietzsche - memorable comparisons with Emerson and Jefferson, and American-style individualism. The author glossed a bit on relating enlightenment/romanticism/modernism to his thesis, but did well relating Nietzsche's philosophy to the decadence of kitsch/populism, and the idea of the 'noble gift'. I don't know all that much about Peter Sloterdijk, other than he was very influenced by Gilles Deleuze, one of my big influences. This was a nice little short book about Nietzsche. Short books about philosophy are rare. I'll always remember where it ends, talking about Nietzsche and the Sun, something to the effect of "Let's remember Nietzsche this way, happy, lying in the sun. Another low point for the Intervention Series. This book is entirely too short, and while I understand it's from a speech, isn't as elaborated as it could be. I'm not even entirely sure what Sloterdijk's revelations are. He seems to meander through the appropriation and "cutting-up" of biblical texts (which I enjoyed thinking about) and how one's use of language creates them as a brand. In Nietzsche's case, he becomes the brand of individualism taken forth by Oscar Wilde and perverted by National Another low point for the Intervention Series. Interesting theory, and it really got going at the end, but a little too entrenched in an academic understanding of Nietzsche. Too pedantic and laborious. Peter Sloterdijk studied philosophy, Germanistics and history at the University of Munich. In 1975 he received his Ph.D. from the University of Hamburg. Since 1980 he has published many philosophical works, includ Peter Sloterdijk is a German philosopher, cultural theorist, television host and columnist. He is a professor of philosophy and media theory at the University of Art and Design Karlsruhe.